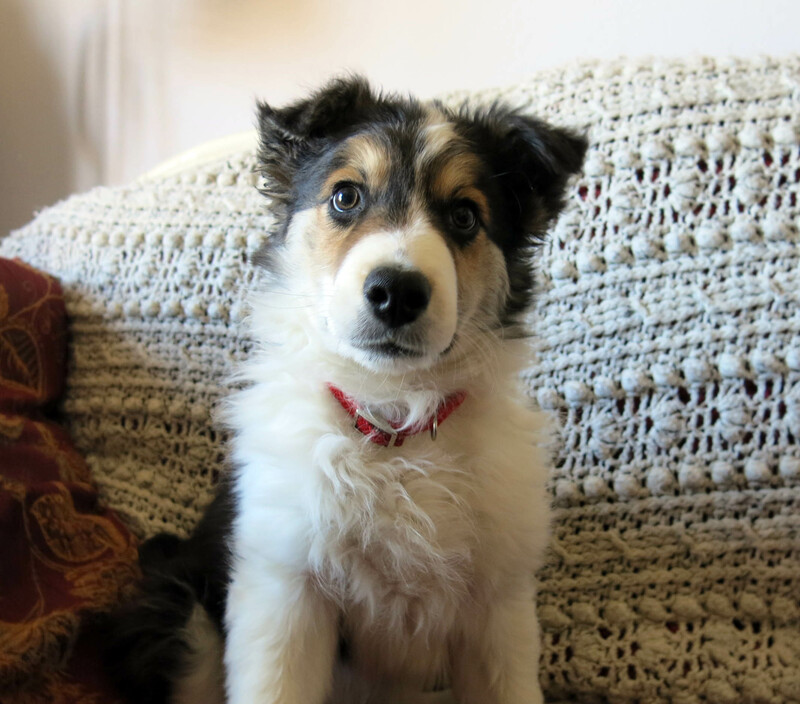 Greetings and salutations, everyone; yes, once again it is I, Mani the tiny purebred border collie, Mani the needle-toothed, chaser of squirrels and untier of shoelaces, here to bring you the latest news about me, and a bit of garden news as well. You may remember me from such posts as “March The First”, among at least a few others. Here I am in a characteristic pose. 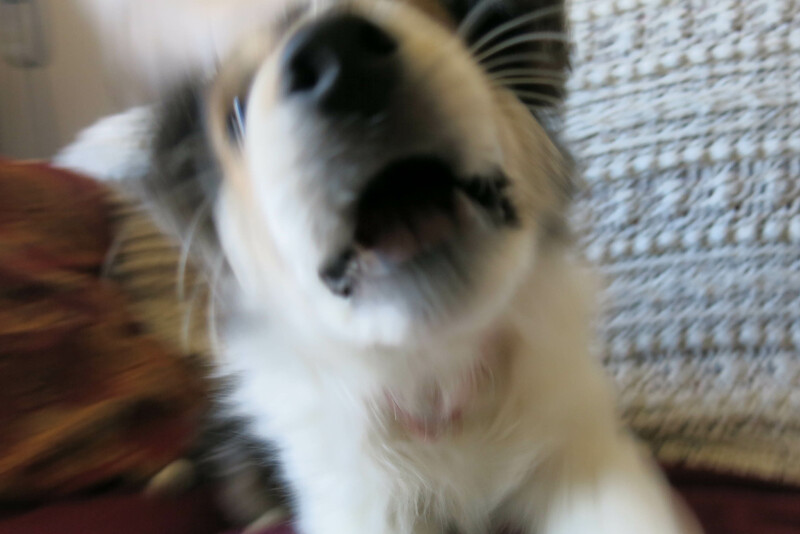 Then I had to attack the camera. I’m very good when it comes to attacking things, if you didn’t know. It’s really sunny here, and a lot of melting is going on, but we still have snow in the back yard. Plenty for me to play in. It’s really slushy and that makes it even better. I lay at the back door, in a yearning sort of way. That gate was made to keep purebred border collies out of the house, which I can hardly imagine anyone wanting to do, but I guess in “the old days” there were issues with muddy paws. And now, for the time being anyway, it keeps me inside, but I still get to look at stuff, and we get lots of fresh air. The guy I live with finally let me out, and we walked down the garden path together, and that’s where I saw the squirrel. I bravely chased it out of the yard, and all I had to do was walk up to it. The squirrel could see my horribly gnashing teeth and the glint in my eyes. It made me feel good to be so tough. I spent all of yesterday untying the guy I live with’s shoes, right after he tied them, and that was pretty fun, but chasing a squirrel was even more fun. The guy I live with says I need to learn how to chase rabbits next. He was really busy, because he finally got on Facebook, and was amazed at all the stuff there, and then maybe not so amazed, but the second time we went out into the garden we wandered around, and looked at things, and he saw this cyclamen, and took a picture of it. He said it looked like it was flowering in the snow, and it really looks like it is. I guess the cyclamen started flowering before I showed up here, and that this is one of those things I’m supposed to get all excited about, and so I looked excited when he pointed it out. 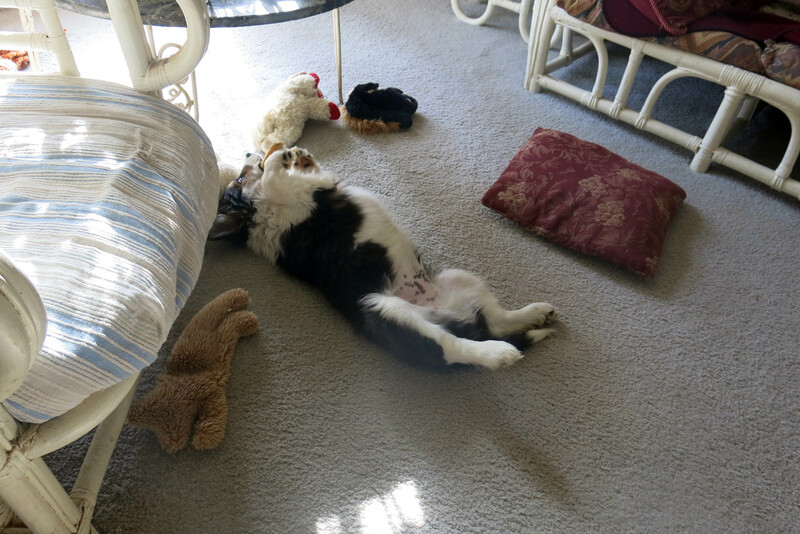 When we came inside, after all that excitement, I felt it was necessary to take a nap. The guy I live with says he’s been affected by Daylight Savings Time, and while I don’t really know what that means, since I eat three times a day, he has seemed fairly listless and boring today. I mean more so than usual. I don’t have much of anything else to say. I’ll leave you with another picture of me, if you can stand the cuteness, that is. This entry was posted in Uncategorized and tagged border collies, Cyclamen coum. Bookmark the permalink. Beautiful cyclamen, cute dog — that’s enough for a first-full-day-of-DST post. You make me remember, Mani, how with puppies it’s a thin line indeed between play and attack. Thanks; it is indeed a thin line. Some things I guess are off limits, like shoes when people are walking in them. It turns out that there are all kinds of rules. Congratulations, Mani! 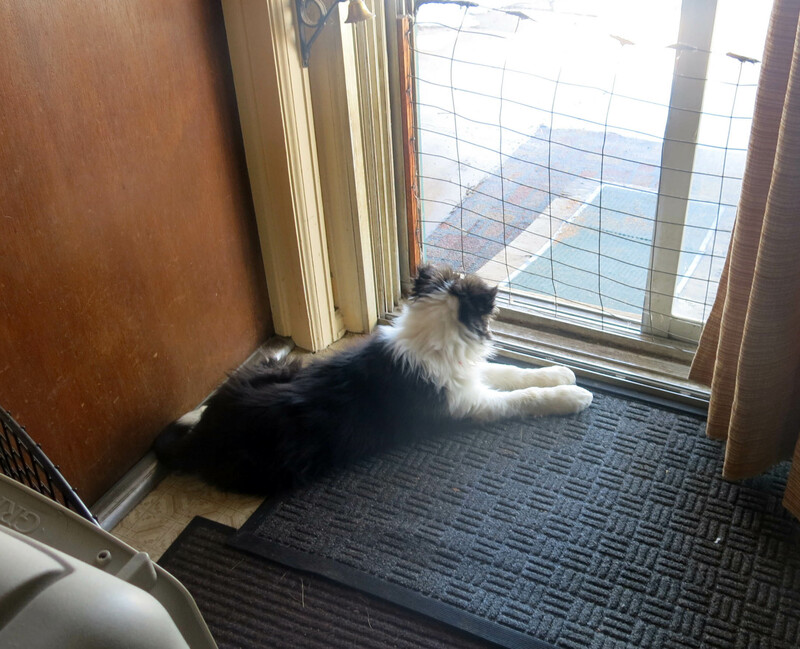 Your purebred border collie ancestry is definitely making itself seen (and heard). You will definitely be the bane of rabbits but I hope that you learn not to bully squirrels. You are indeed too cute. Thanks; I think all I have to do is, like, walk up to a squirrel and say “Excuse me”, and it will run in terror. Rabbits are a little bigger, and might be tough. Thanks; he seems to be able to keep up with me, mostly. 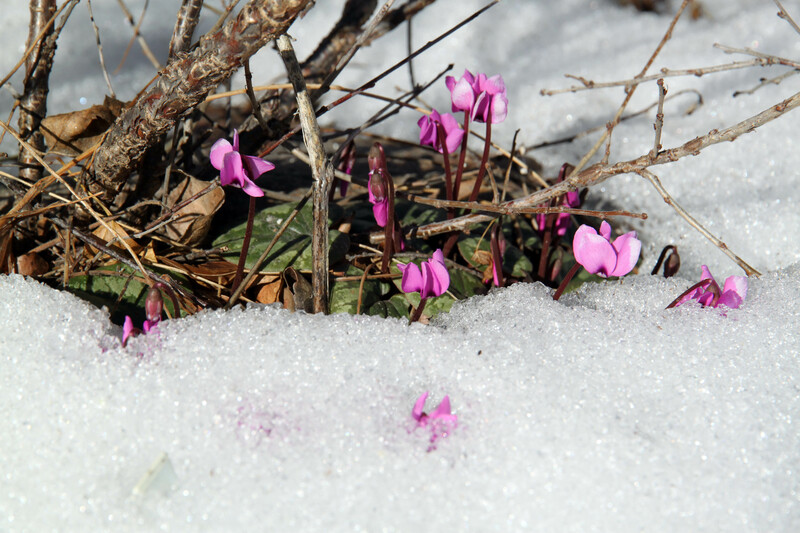 We both think (well, he thinks, and of course I agree with whatever he thinks) that the cyclamen were in fact flowering under the snow. The only time that Daylight Savings Time bothers me is at 6am. We are back to waking up in the dark again and after the Winter we’ve had on the Isle of Long I deserve to never have to wake up in the cold and dark ever again. You remind me that puppies have two speeds: Top and Off. You also remind me that puppies have floppy ears and wide eyes and big feet and a thousand ways of cuteness. We’ve been getting up, well, a little later. I do have a third speed, Chewing. Like if I get a chew stick, and don’t lose it right away, I can chew happily for quite some time. I’ve discovered that the bed is the best place for this. Thanks; I do agree I’m cute. I use this to get out of trouble, you understand. Double knot the laces. Problem (should be) solved. Yeah, that’s it. Or slippers without shoelaces. Mani, you are growing a mile a minute! Though it is not your favorite I am also glad to see some relevant plant-related news, weather and photos. 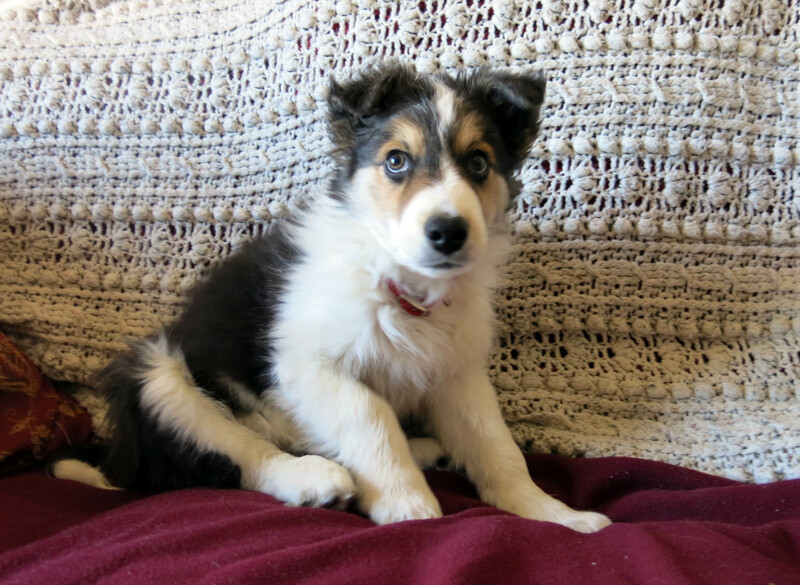 However, I don’t know where else I would find photos of such a cute (and exceedingly intelligent) growing border collie. You know, I don’t know either. We do have the occasional plant news, but right now I think I have to rearrange the living room. the level of cuteness is SUPER high!! thanks, mani ~ your photos make me smile. and i love the tale of the shoelaces. Thanks; I know I can rely on the cuteness for at least a while. I mean to get out of trouble. Totally melted by your cuteness. Polka dot puppy belly! Thanks; I think the guy I live with is, too. Fortunately for me. Sent your guy a friend request from me: Flora Gardener. You’re welcome. Facebook is kind of chaotic. I was going to use the name Rupert von Schwartzerdingen, but decided to use my own name. That’s why several of your friends said things like “welcome to the nuthouse”.